FRONT ROYAL, VA — "Sharpton, Matthews Blast Virginia's Racist Voters"
Oh, you didn't see that one? Don't worry. Neither did I. Among all the commentary addressing the recent election results in Virginia, the Rubble notes a profound silence regarding an issue that usually haunts the imagination of professional moralizers. Yes, the Rubble is still waiting for Chris Matthews, Al Sharpton, and their fellow hucksters to attack the virulent racism of the Virginia voters who defeated Bishop E. W. Jackson, a Harvard Law grad, in the race for Lieutenant Governor. Mr. Jackson is black. Mr. Northam is white. Well, the hucksters are silent. For them, the racism door swings only one way – to the left. Perhaps it's because Mr. Northam was the candidate of the National Abortion Rights Action League and Planned Parenthood. His key backers support abortion up to the moment of birth and the right of teenage girls to have a personal relationship with their abortionist without the knowledge or consent of their parents. Now national scolds like Charlie Rangel, Robert Redford, and the New York Times routinely assail Obama's critics on the grounds that they must be racists. Even Oprah has gotten into the act. Planned Parenthood, which spent millions to defeat Mr. Jackson, is racist to the core. ... [It] is more racist than the KKK. Rep. Alan Grayson, Democrat of Florida, goes even further: Tea Party opponents of Obama's agenda, he says, are like the Ku Klux Klan. The dimwitted Graysons of the world rely on public ignorance. They are not disappointed. After all, few members of the government school union will tell their captive pupils that, for several decades, the Ku Klux Klan was the backbone of the Democrat Party — and not only in the South. Moreover, the Klan hates Catholics a lot more than it hates Blacks and Jews. Consider: Obamacare's "Contraception Mandate" attacks the religious liberty of Catholics. Embracing Mr. Grayson's logic, couldn't we conclude that the Obama Administration is no different than the Ku Klux Klan? Back to the race-baiters: Why haven't we heard one muted chirp from the usual suspects regarding the obvious racism of Northam's supporters? After all, they came out in droves to oppose the election of a black man to the second-highest office in Virginia. Moreover, Planned Parenthood, which spent millions to defeat Mr. Jackson, is racist to the core. ""Planned Parenthood has been far more lethal to black lives than the KKK ever was," Mr. Jackson says, standing Grayson on his head. Auxiliary Bishop Martin Holly of the Archdiocese of Washington has observed that, "As an African American, I am saddened by evidence that black women continue to be targeted by the abortion industry…. The loss of any child from abortion is a tragedy, but we must ask: Why are minority children being aborted at such disproportionate rates?" Mr. Jackson joins Bishop Holly in exposing and condemning the dirty little secret of the pro-abortion crowd. Jackson charges that abortion in America is a racist proposition — he calls it "genocide." It targets the unborn children of certain minorities – especially African-Americans and Hispanics — in much greater proportion than the rest of the population. Oh, sure – the Rubble readily admits that many Northam voters would insist that they aren't racists: they oppose Mr. Jackson not because he is black, but for other reasons, they would no doubt claim. But here we adopt the logic of Al Sharpton and Chris Matthews to observe that, yes, there are also probably some folks out there who claim that they buy Hustler magazine so they can read the articles. So let's put it bluntly: Planned Parenthood is more racist than the KKK. In all this, alas, the Catholic bishops are hardly a beacon of truth and light. After the 2008 elections, former USCCB President Wilton Gregory exulted. For him, the victory of the most pro-abortion presidential candidate in history marked a "great step forward for humanity." Bishop Gregory's successor at the USCCB on November 5 was Timothy Cardinal Dolan. After the election, in which the two most pro-abortion candidates in Virginia history defeated the Commonwealth's most pro-life ticket ever, Cardinal Dolan, had no comment. The spokesmen for Francis X. DiLorenzo, Bishop of Richmond, Virginia, and Paul. S. Loverde, Bishop of Arlington, also had no comment. The election of the most pro-abortion ticket in Virginia history marked a "great step forward for inhumanity." When a pro-abortion black candidate defeats a white pro-life candidate, Catholic bishops applaud the black man's victory in the name of "humanity." When a black pro-life candidate is defeated by a white, pro-abortion candidate, the bishops are silent. 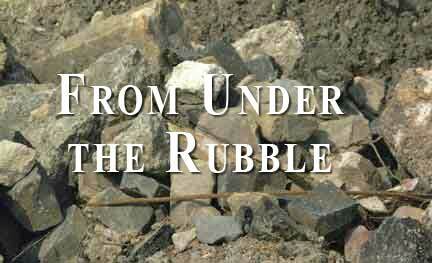 Perplexed by this roiling contradiction, the Rubble sought an explanation. We found it in Brothers and Sisters to Us, an official Pastoral Letter on racism issued by the USCCB, the Catholic bishops' conference, in 1979. (The Rubble's in-depth examination of that fascinating document will appear in the January 2014 issue of Chronicles magazine, published by the Rockford Institute). In their pastoral, the bishops reveal "an unresolved racism that permeates our society's structures and resides in the hearts of many among the majority." The principle is simple, almost elegant. Only "the majority" can be guilty of racism. Even there, however, the confusion abides: the bishops assail racism only in selected categories. While today's Catholic bishops are silent on the possibility that racism might have motivated the white opposition to the black Mr. Jackson, they are vocal in their moral condemnation of anyone of any race who opposes Obama's efforts to grant amnesty to millions of illegal aliens. Cardinal José Gomez of Los Angeles, ... has described critics of amnesty (including many Hispanics, by the way) as selfish, insensitive, nativist, xenophobic — perhaps even bigoted. Catholic social teaching and the teaching of the Second Vatican Council firmly defend the rights of the laity to disagree with bishops on political questions. Timothy Cardinal Dolan, as president of the USCCB, has reaffirmed this sound teaching in public. Yet he implies that those opposing amnesty legislation are perpetuating "a stain on the soul of our nation." Soon-to-be Cardinal José Gomez of Los Angeles, the USCCB's point man on immigration, leaves little to the imagination. In various settings, he has described critics of amnesty (including many Hispanics, by the way) as selfish, insensitive, nativist, xenophobic — perhaps even bigoted. So much for the pastoral approach. The cover of his recent book on the subject humbly celebrates Archbishop Gomez as "one of the leading moral voices in the American Catholic Church." There is certainly no doubt that America isn't moral enough for Abp. Gomez. Yet America cannot reform itself. The only way to "renew the soul of our nation," he says, is to let his fellow Hispanics do it. Americans must grant amnesty to the millions already here illegally, and then move on to welcome some thirty million more over the next quarter-century. Only then shall our national soul be healed. The confusion continues to compound. Today our bishops have raised the agenda of the welfare state to the level of "moral imperatives." Opposition to amnesty for illegal aliens is immoral. The Ryan budget is immoral. Opposition to Obamacare is immoral — oops, it was immoral, until the HHS Mandate made support of Obamacare immoral. It's curious: for the bishops, deficit spending is not immoral, even though it steals from the children of the future. Inflation is not immoral, even though it hits the poor and the elderly the hardest. Foreign aid bills that contain half a billion a year to fund "family planning," contraceptives, and abortifacients in Catholic Third-World countries are not immoral; in fact, lobbyists from the bishops' conference actively support them on Capitol Hill. Our parish's Sunday collections pay for that, by the way. Well, Virginia's voters will soon forget Mr. Jackson. And so what if some of them really are racists, as the bishops' Pastoral Letter implies? Well, perhaps they can take comfort in the bishops' Get-Out-Of-Hell-Free Card: "Racism is a sin," the Pastoral Letter explains, but it's kind of unique, see, because it resides in the "collective consciousness of Americans." "Perhaps no single individual is to blame." Well, personally, the Rubble blames Oprah. But when she invites Bishop Jackson on her show, all will be forgiven. And that will be a great step forward for humanity.